A home’s windows can serve many functions. They can increase value and curb appeal, improve energy efficiency, and of course increase the amount of natural light in your home. Like many other home upgrades, replacing windows isn’t frequently necessary. Windows usually last 15-20 years, but when they start to show age, it could lead to bigger problems. Knowing when to replace your windows is important. Here are some of the main signs that you need new windows. You can feel a draft coming from around your windows. A sure sign of age with windows is when they begin to shrink or warp. This can cause drafts in your home and allow warm air to travel out of your home in winter months. This decreases your home’s energy efficiency and can make your energy bills skyrocket. On a cold day, touch your windows. If they feel cold to the touch, that usually means that the warm air from your furnace is being cooled down as soon as it gets within a few feet of your windows. Older windows are generally single-paned and susceptible to leaks, while newer windows are much more efficient and designed to help prevent air transfer. There is visible damage to the windows or frames. An obvious sign that windows need to be replaced is visible damage to the windows or window frames. 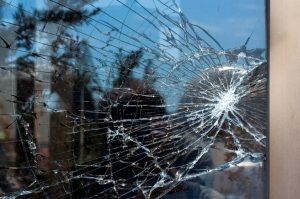 A broken pane not only lets in moisture and drafts, but can be dangerous and should be replaced. Frames with visible damage are also in need to an upgrade. A wooden window frame that has been exposed to moisture can begin to warp, causing the windows to be difficult to open and close. Not only this, but prolonged exposure to moisture can cause more serious problems, like mold. While a window or frame that is leaking can be repaired, that may only fix the symptoms of the problem, not the problem itself. Find out what is causing the leak to determine the best course of action or send us a message for help. The windows aren’t operating properly. Check each window for proper operation. They should be easy to open and close and should stay open without being propped. Windows that won’t stay open can be dangerous, especially to children or pets, and need to be replaced. Likewise, if windows are painted or swollen shut, it’s time to replace them. Wood windows are particularly bad about this in hot or humid weather. You shouldn’t have to fight with your windows to open or close them. Condensation forms on the windows regularly. Another sign that you need new windows is when condensation or ice starts forming inside the window. If the condensation is between the two panes of glass in your windows, this is a sure sign that your windows’ seals are failing and need to be replaced. Like leaky windows, windows that frequently have condensation, ice, or frost on the inside can cause mold growth. If not remedied properly, the mold can spread to other areas like drywall or baseboards and become an even bigger problem. We suggest replacing windows with this problem as soon as possible to minimize more issues. With so many new energy-efficient windows available, new windows can increase curb appeal, lower your electric bills, and improve your home’s function. Upgrading your windows is a great renovation project that is sure to pay dividends. When replacing your windows, choose your contractor carefully. If you are a DIYer, review your warranties carefully, as some warranties may be void if the windows are not installed by a professional. No matter your reason for wanting or needing new windows, the professionals at E3 Roofing and Remodeling can help. Give us a call, connect with us on Facebook, or send us a message to find out what we can do for you.